i ordered this rug in the 5x7 size. to be honest i havent received it in the yet as it was lost in the mail (maybe due to our snowstorms) however, i talked to overstock and they assured me they would replace it if it isnt found in 3 days. i have to say i am impressed with overstock in general. the reason i ordered this is because my friend has this very same rug and it is beautiful and is the reason i purchased one. colors are as expected, varied and highlights the orange well too. very nice rug and comfy too. 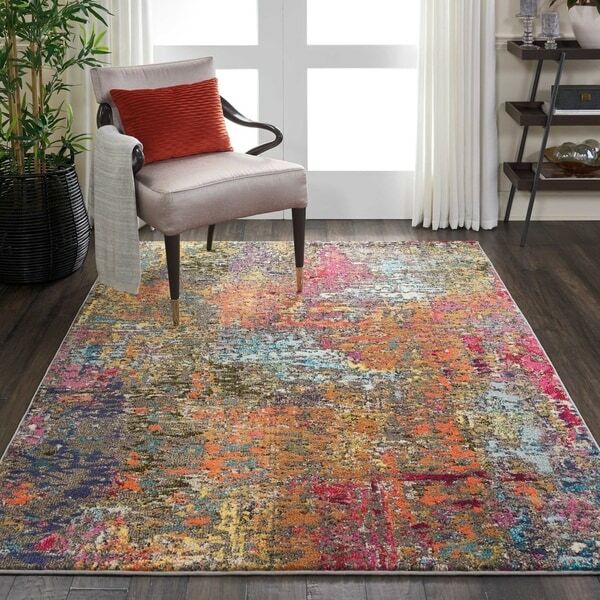 Nourison Celestial Abstract Multicolor/Orange Area Rug - 5'3" x 7'3"
Nourison Celestial Abstract Pink/Multicolor Rug - 5'3" x 7'3"
Nourison Celestial Abstract Multicolor Rug - 7'10" x 10'6"
Safavieh Monaco Boho Watercolor Green/ Blue Rug - 5'-1" X 7'-7"
Cosmic consciousness inspires the Celestial Collection by Nourison. These heavenly area rugs possess a dramatic beauty, with rich, saturated colors that swirl together in unique and vivid designs. Each stunning area rug conveys a sense of movement and energy that verges on divine. An amazing explosion of colors brings a vibrant allure to any room with this Celestial Collection rug. Dense abstract patterns play out on a silky pile like an artist's palette, creating a beautifully bohemian rug. The colors were so different than the photo. For a rug that is called Celestial Abstract Multicolor/Orange, there was absolutely no orange on the entire rug. I had to send it back. Nourison Celestial Abstract Ivory/Multicolor Rug - 5'3" x 7'3"
Nourison Celestial Seaglass Rug - 7'10" x 10'6"
Nourison Celestial Ivory/Multicolor Abstract Area Rug - 7'10" x 10'6"